No. 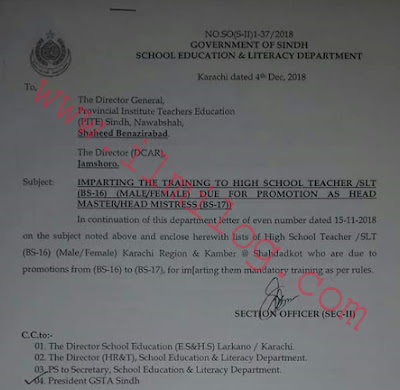 SO(S-II) 1-37/ 2018 by a government of Sindh school education & literacy department Karachi dated 4th Dec 2018 regarding High School Education Teacher Training for Promotion in Sindh. 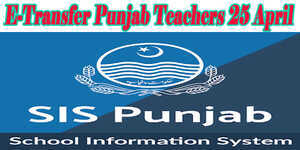 The Director General, Provincial Institute Teachers Education (PITS) Sindh, Nawabshah, Shaheed Benazirabad. 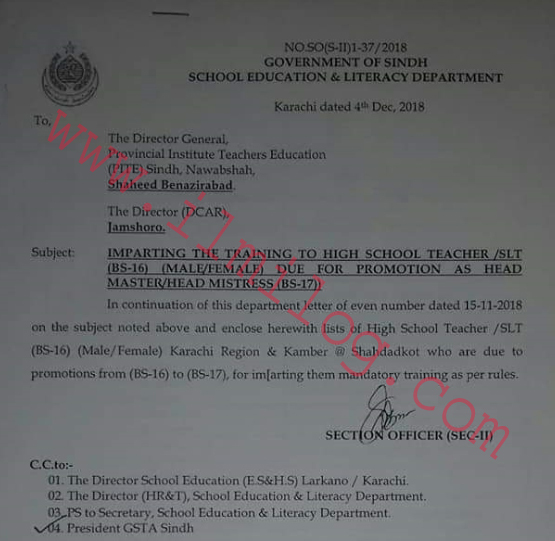 In continuation of this department letter of even number dated 15-11-2018 on the subject noted above and enclose herewith lists of High School Teacher /SLT (BS-16) (Male/Female) Karachi Region & Kamber Shahadadkot who are due to promotions from (BS-16) to (BS-17), for imparting them mandatory training as per rules.